Summary: For many years, forensics experts have worked to recreate what the faces of our ancestors looked like. Today, with modern advances in science and technology, including 3D scanning, this dream has become a reality. The Goal: To use handheld 3D scanners to capture the skulls and bones of ancient humans and animals, then create precise 3D models of them, for viewing and printing, and to accurately reconstruct what they once looked like in real life. How much like us did our human ancestors and ancient people look? That’s a question artists and scientists like Caroline Erolin and Dr Christopher Rynn from the University of Dundee, Scotland are trying to get answers to. Caroline and Christopher specialize in anatomical 3D visualization and can reconstruct the appearance of a deceased human based on their skull bones. Archaeological facial reconstruction is in high demand among museums and documentary film makers. Most recently the face of “Thankerton Man” was reconstructed for the Biggar and Upper Clydesdale Museum in Scotland. Found in a stone cist in the Scottish village of Thankerton in 1970, the skull was radiocarbon-dated to between 2460 BC and 2140 BC and thought to have been that of a man aged 18 to 25. 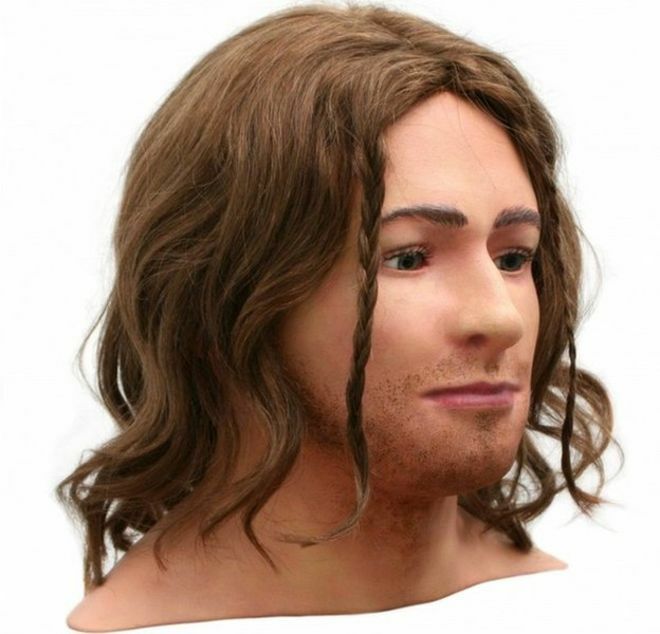 Caroline and Christopher’s work is not limited to archaeological facial reconstruction alone. 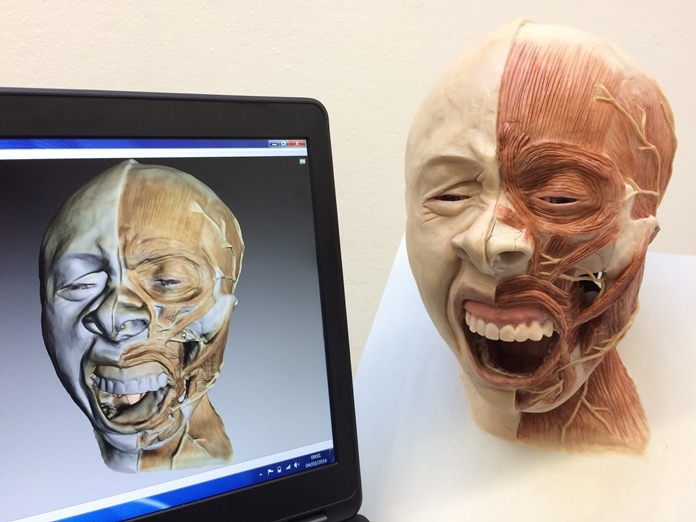 They actually run MSc’s in Medical Art and Forensic Art and Facial Identification at the University’s Centre for Anatomy and Human Identification (CAHID). They work with policy-makers and are actively involved in medical and forensic casework and facial identification, providing evidence to the UK criminal justice system. 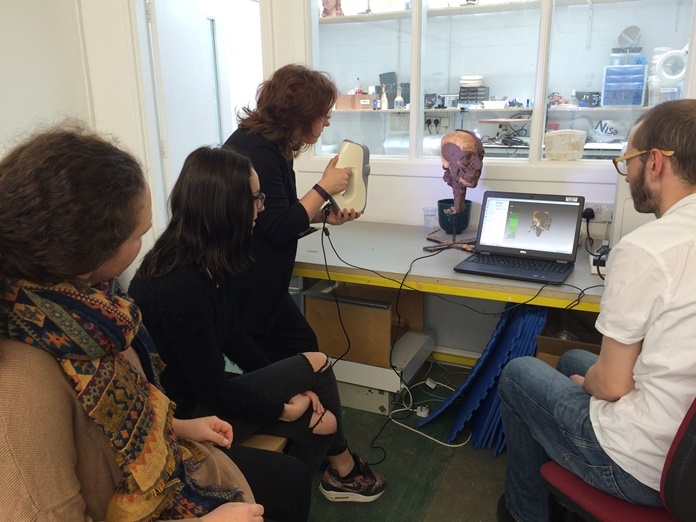 The Centre recently turned to Patrick Thorn & Co., Artec’s UK Gold Partner, to purchase an Artec Eva 3D scanner together with an educational package, as part of the Centre’s move to upgrade its current methods of imaging. Patrick himself installed the Artec system and conducted a one-day comprehensive training course on it and the capabilities of Artec Studio 3D scanning and post-processing software. 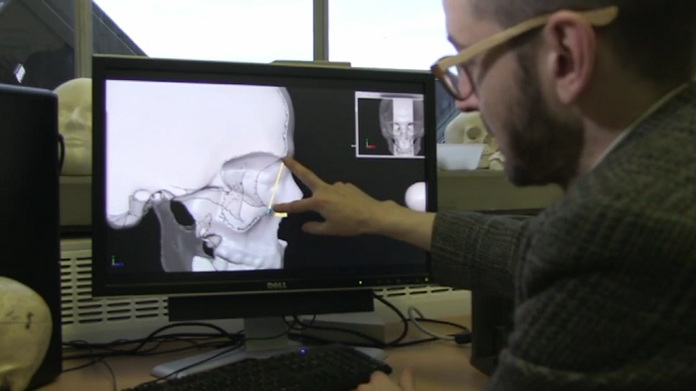 His visit to CAHID happened to coincide with the one of a BBC documentary crew, who filmed an episode about facial reconstruction with Christopher for the “Inside Out” program, which covers regional stories and investigations throughout the UK. The reconstruction process involves rebuilding the facial anatomy upon the skull. This can either be done in clay upon the cast or digitally modelled onto a scan in the computer. Caroline says that there are a number of advantages to working on a scan: it doesn’t damage the actual skull and once digitized, the layers of the reconstruction can be viewed and modelled independently. Once completed, the final facial reconstruction can be compared to the face of the living individual. One piece of coursework involves reconstructing the facial muscles in wax to create a detailed and lifelike anatomical model. This piece helps teach the students both facial anatomy and sculptural skills in advance of working on the reconstructions described above. A number of students have used Artec Eva to scan their models and create digital versions that can be shared and interacted with online using Artec’s Viewshape site and other 3D model galleries. Scan of MSc Forensic Art student coursework (depicting a yawn) in Artec Studio. The hope is to make the collection more accessible to everyone, including the general public and local population as well as staff and students. Once scanned the intention is to create a virtual online museum where 3D models of specimens can be viewed and interacted with. Some will also be 3D printed so they can be handled at open days and taken to schools. 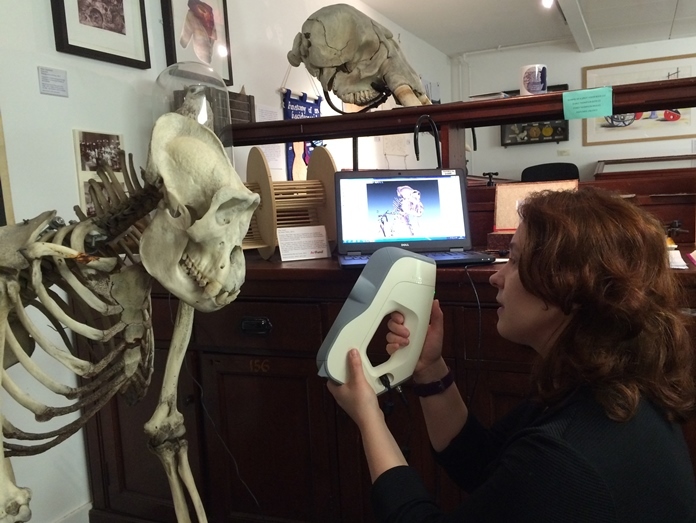 Caroline scans a gorilla skeleton at the D’Arcy Thompson Zoology Museum. 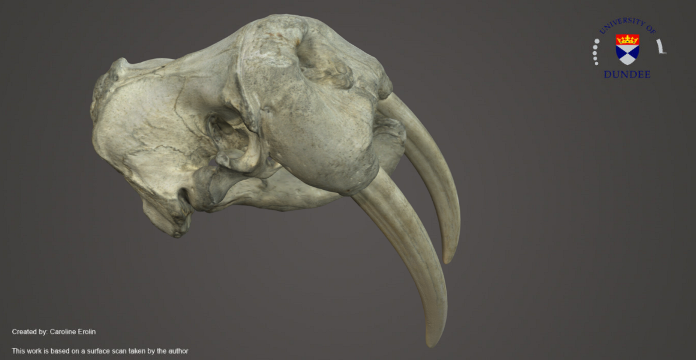 Scan of a Walrus skull from the D’Arcy Thompson Zoology Museum, made with Artec Eva. Showing a group of students how easy it is to use the Artec solution. Following up on their successful experience with Artec Eva and cooperation with Patrick Thorn, CAHID have purchased an Artec Space Spider to enable the capture of smaller and more detailed specimens. Plus combining the larger scans of Eva with Space Spider’s finer detail is a perfect solution for the Centre’s specialists. 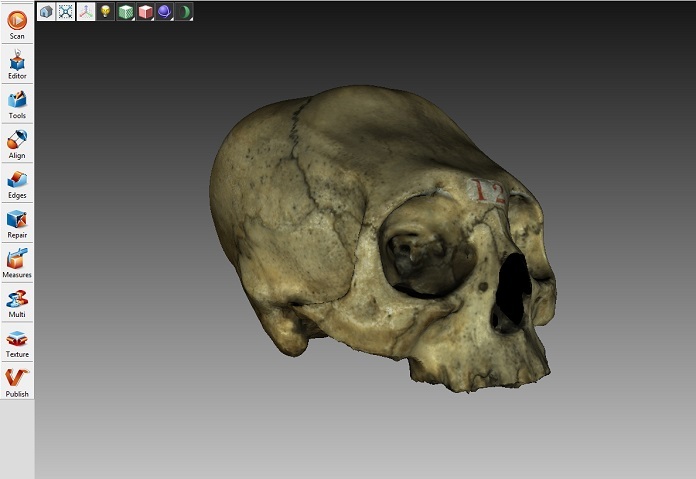 A scan made using Artec Eva, of an adult skull having undergone cranial binding from CAHID’s skeletal collection. CAHID’s plans include digitizing its extensive skeletal collections, including the Scheuer Collection of juvenile osteology. The Scheuer Collection is believed to be the only active repository for juvenile skeletal remains held anywhere in the world. It consists of the remains of over 100 sub-adult individuals, collected from archaeological and historical anatomical sources. Many of these specimens are very fragile and handling them is highly restricted. By digitizing the collection they will become accessible to students online visually and also as 3D printed specimens for use in class.